This one-time purchase gives you a Book and a CD with 380 beautifully designed handouts in PDF format. The original purchaser (the parish) then has unlimited permission to reproduce these handouts. Rather than having to continually repurchase participant materials year after year, you now only incur the cost of using your parish's copy machine. Also, you are freed from having to follow a pre-set curriculum created by a publisher and are given the flexibility to choose the order of topics to follow that best suit the particular group of participants you have this year, right now. 2. Give each participant an empty 1.5" 3-ring binder. 3. Make copies of handouts on the CD for your next session and 3-hole punch them. 4. 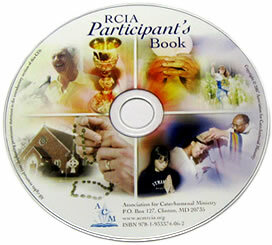 At the RCIA session, give the handouts to the participants to put in their binder. 5. Slowly, over time, their binder grows in size. So, for example, if you were to lead a catechetical session on May 2 on the Trinity, you could print out one copy of each of the following handouts: "The Blessed Trinity" (under Doctrines), "The Sign of the Cross" (under Special Topics), "St. Athanasius" whose feast day is May 2 (under Lives of Saints), "Finding the Desire of My Heart" by Fr. Ed Fride (under Conversion Stories), and "The Blessed Trinity ~ Suggested Questions for Discussion" (under Small Group Questions). Then, you would head over to your parish copy machine and make multiple copies of each handout before 3-hole punching them in preparation for the upcoming session. With a little creativity, you could even put handouts from different categories on different colors of paper. For example... Doctrines (White), Special Topics (Yellow), Conversion Stories (Blue), Lives of the Saints (Light Brown), Psalms and Canticles (Green), etc. If an inquirer, catechumen, candidate, elect, or neophyte misses a session, you can easily slip that session's handouts in the mail or hand them to their sponsor/godparent who can hand-deliver them to their participant when they meet with them outside of the regularly scheduled RCIA sessions. But don't just limit yourself to your parish catechumenate. These handouts can be reproduced for adult faith formation sessions, parent meetings for parents of students in catechetical formation programs, bulletin inserts... and the list goes on. Also, you are automatically given permission to copy the entire contents of the CD to your computer's hard drive for easier and faster access to the handouts. This saves you the hassle of having to insert the CD into your compact disc drive each time you wish to access the contents on it. Below, we have given an abbreviated list of handouts from each category. This list is incomplete. › The artwork on each handout has been selected to accommodate clear and sharp photocopying of all handouts. › Comes with extensive printed indexes and cross-reference system. › Art and photography selected to represent the rich diversity of the Catholic faith in many cultures and many eras, from our Old Testament heritage up to the worldwide Church of modern times. › You decide what handouts to use, when to use them, and who receives them. 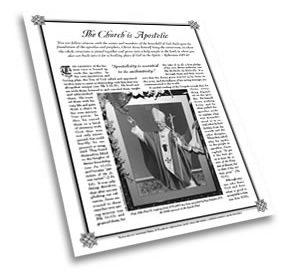 › Designed for systematic and organic catechesis, covering the entire content of the Catechism of the Catholic Church, with over 650 citations. › Nihil Obstat and Imprimatur. › No other publisher is offering their entire set of materials as copyable, and no other publisher provides all participant materials on CD.